Can you please add more information about your question? Did you mean that when you hit Submit button, nothing happens as if it won't let you proceed? We will wait for your response. 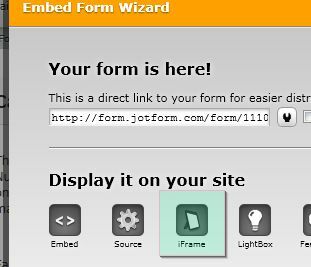 When I go back and press "submit", nothing happens...in other words, the form is not shown on my website. and it does not show that anything has been submitted. Can you please re-embed your code and use iFrame method instead? Also, please provide us a link to your website, where the form is located. still not working. When I open website the URL is appearing, not the actual form. Do I need to give you a "profile"? I don't see anywhere to update my profile, or make sure you have my website link updated. Is there any option you can add HTML codes into your website? If yes, then do it that way because if you are placing the codes on plain text format it will not be executed on your page.